Application for wall or ceiling. 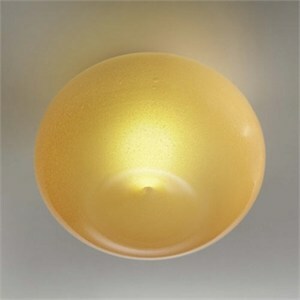 Blown from amber glass infused with silica sand dust with a frosted interior finish. Offered in two sizes. Metal structure finish in brushed bronze. Also available in similar pendant application. 35 (small)- 13.75"D X 10.5"H.
45 (large)- 17.75"D X 14.25"H.